It all started with when I went to a salon two years back to trim my ends and they ended up cutting my hair so short! I was sobbing for 4 days in shock and then after googling for 4 more days, I decided to grow back my hair quickly and started on a routine which am sharing with you. In almost 6 months, my hair grew back to its previous length. This routine also helps in reducing hairfall. Before talking about hairfall and hair growth, let me share with you some details on the hair growth cycle so you can get a better understanding. The hair growth cycle consists of 4 stages – anagen phase where hair grows around half inch a month, catagen phase – a short transitional phase that lasts about 10 days, telogen phase – the resting phase for hair which lasts around 3 months and exogen phase where the old hair sheds and new hair grows. Each hair follicle independently goes through the above phases at different times. Since some hairs are in the exogen phase at any time, it is natural to experience hairfall of 100-150 strands per day. Also seasons may affect the growth cycle. Hair growth is faster during the summers. Typically more hairs enter the telogen phase during the month of July and so increased hairfall during October or November is common. So, if you tend to experience more hairfall during winters, don’t fret! It could just be a seasonal hairfall issue. What started me on reading about this hair growth cycle was, over the past few months of winters, I was experiencing more hairfall than usual and was curious to find out if seasons have an impact on it. Even in that case, we can control hairfall to a certain extent by following a good hair care routine and taking extra care. So let me share with you what has worked for me in combating hairfall and growing my hair longer. Oil Massage: I am not much of an oil person generally as I hate the thick, greasy feeling of oils and also the smell of many oils gives me a headache. Recently, I bought this Forest Essentials Ayurvedic Bhringraj Herb Enriched Head Massage Oil and am loving it. It is light, non-greasy, doesn’t have a headache inducing smell and also gives good results. Makes hair smooth and shiny. I will post a detailed review on this soon. I warm up the oil, massage my scalp with it for around 20 minutes, finally apply some oil on the hair lengths as well and leave it overnight. Hair Mask: In the morning, I apply a hair mask of curd and Aroma Treasures Aloe Vera Gel mixed with either fenugreek seeds powder, amla powder or curry leaves powder depending on whatever I have at that time. I love this aloe vera gel as its paraben-free and also enriched with essential oils. I also add few drops of Aroma Treasures Lavender Essential Oil to the mix as it helps in hair growth. But then, as it was getting very chilly here in Bangalore in winters and I was catching cold often, I stopped using curd and got a readymade hair pack – Banjara’s Amla Wet ‘n Wash. I wouldn’t say its very great, but considering the very affordable price point, it works decent enough. I leave the hair mask for around half an hour before showering. I try to follow the hair mask routine atleast two times a week, but sometimes due to time constraints (I miss my alarm due to daydreaming 😉), I can do only once a week. Shampoo: Am using the Kama Ayurveda Sanobar Hair Cleanser currently. I got two of them, one which I won in a contest and other I got in MSM Box. It cleanses hair well and has a fresh citrusy orange fragrance and I liked it. But then I saw sulphates in the ingredients list and so I don’t think I will be repurchasing it, as considering its high price point you can easily get sulphate-free shampoos for the price. Conditioner: I was initially using the Kama Ayurveda Sanobar Hair Conditioner and loved it. It is light, hydrating, makes hair smooth and also helped to reduce my split ends to a great extent. After this got over, I purchased the Sand for Soapaholics Hair & Glory Conditioner. It is one of the best I have ever used. Contains 61% coconut water and 18% aloe vera extract. And also has a fresh menthol smell. I think I will post a separate review on this as well, singing its glories. I apply the conditioner on the hair lengths and leave on for 5 minutes and wash off. Hair Serum: After towel drying my hair, I apply a couple of drops of Dove Elixir Hibiscus & Argan Oil Nourished Shine on the hair ends. I also use it on other days whenever my hair becomes dry and frizzy. Actually, as per product claims, this can be used like a regular hair oil. But I have tried it and it causes much hairfall. Seeing the ingredients list, it contains 78% mineral oil, no wonder! So I won’t recommend taking this anywhere near your scalp at all. Though as a serum it works well to smooth out hair, reduce frizz, gives a nice shine and has a pleasant fragrance. But I have used this for a long time now, over a year and got bored. It’s not getting over only. Diet and supplements: Diet plays an important role in hair growth. Since I stay away from home, I eat outside all the time. Many times I skip breakfast and just have a cup of coffee (Cringe!! Worst habit ever! But having a coffee machine in office, can’t resist it And am just lazy to have breakfast 🙄). But I have observed that having a proper breakfast helps control hair loss to an extent. You don’t have to focus too much on diet. A handful of dry fruits and nuts + any health drink + a glass of fenugreek seeds soaked in water overnight, just adding this to your routine can do wonders to your hair. Health drink can be anything you like. My dad bought me amla juice, beetroot juice from Khadi and they really help a lot to remove toxins and purify the body. Coming to supplements, I was initially taking Biotin and it has helped a lot in hair growth. Now, I have shifted to more herbal ones. Am using Morpheme Remedies Bhringraja – 500mg supplement. I can’t say whether it would work only on its own. But combined with the entire routine, it has helped to make my hair healthy and stronger. Apart from this, I have been going for a head oil massage at a salon monthly once. * If you have long hair, it tends to get tangled and knotted often at the ends. Spend some time everyday to remove the knots, else it can lead to hair loss. Use your hands to gently remove the knots rather than a comb. * Do not use harsh chemical-based products. It can cause scalp irritation and lead to dandruff. Treat your scalp and hair gently. Preferrably go for sulphate-free, paraben-free shampoos and silicone-free conditioners. * There’s lot of debate on how often to wash your hair. Googling about it would just confuse. I don’t have any fixed schedule to wash my hair. I wash it whenever I feel its too oily or too dry, which can be twice or thrice a week, depending on the weather. However, when am in my hometown Chennai, washing my hair, even alternate days is not enough as its so hot and humid. The key is don’t let your hair become too oily or too dry. Both lead to hair loss. For those workout and hit the gym everyday, they may need to wash daily. * Expensive products doesn’t mean they will do the best job. If you can see above, I have included high end, mid-range as well budget-friendly products. I would advise you to choose products depending on your hair type and budget. * There is no miracle one hair oil or product for hair growth. It requires following a hair care regimen (let’s stop using the word ‘routine’ as routines are boring) and being consistent with it. * Finally, brush/comb your hair gently. 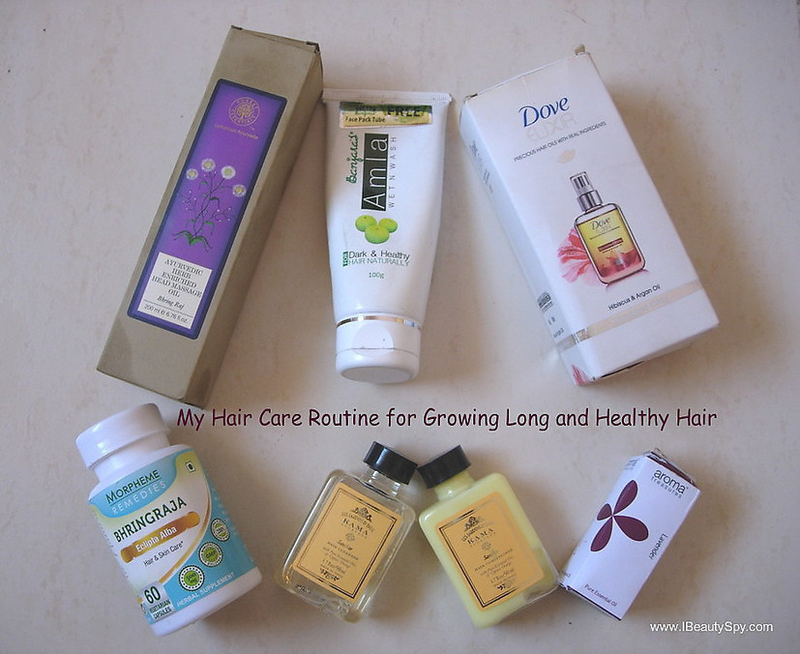 This is the hair care routine that I have been following for past 4 months. My hair loss has decreased significantly, grown more in length and is more healthy and stronger than before. Am next aiming for thicker and voluminous hair and will create a routine for it. What is your hair care routine? Share your favorite hair care products in the comments below. That’s a detailed and comprehensive post! Hey , can you tell which brand of biotin did you take?